I was surprised by the focus of prompt five in Shimelle's Something From Almost Nothing class - page protectors. I guess I haven't considered page protectors in the same category with patterned papers, cardstock and embellishments. The prompt had inspiration for cutting up page protectors to create pockets on your page, sewing page protectors together to ensure the continuity of multiple page stories, and cutting slits in page protectors to make your page interactive. Although I have cut slits in my page protectors before, I was not really inspired to try any of the other ideas in this prompt. However, it did remind me to flip through my divided page protectors, and I pulled out one to create two more layouts for our cruise album. 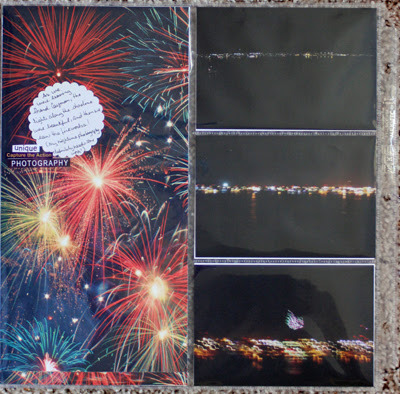 This is the second divided page protector I've used for our 10th Anniversary Cruise album, but I will definitely be adding more as I continue in my quest to complete this album. 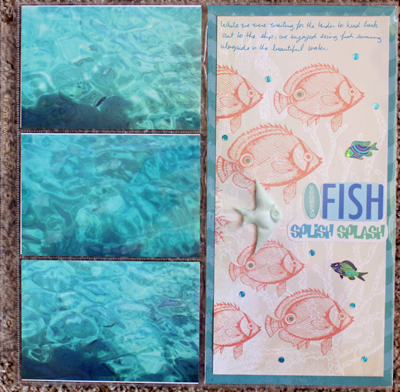 I was quite proud of myself for remembering I had some themed papers that would work for these layouts - the fish & the fireworks! Have you used any themed papers lately? Since I so rarely scrap with them, I'd already gotten rid of most of my themed papers. You've used them well! I remember being skeptical of this prompt but then finding it pretty useful. I made pockets for newspaper articles in my son's sports album, I think. Brilliant firework photos ;). You've used the papers really well. I am afraid I use papers so little that I've put all mine into a box out of sight! I've been enjoying adding flaps to my pages and using the divided page protectors I have. Not so fond of cutting them up - tend to use washi tape rather than sewing too. I don't have many themed papers left in my stash, but I love divided page protectors---don't think I've ever cut into one of them though.